The warm weather of summer tends to bring people together to share good food and good company. If you're looking for a way to dress up your dining or patio table without too much fuss or spending too much money, these six easy summer centerpieces will add interest without commanding a big investment of time or money. A large glass vase filled with whole oranges, lemons and limes is a super easy and quick centerpiece that you can throw together at a moment's notice. However, if you have a little more time and a few extra supplies, you can make a more impressive display. If you are using the optional embellishments, first use glass paint to embellish the vase. Paint on any designs that you like, but be sure to leave enough clear space for your fruit to show through. Allow the paint to dry and then tie decorative ribbon or raffia around the middle of the vase. If you are using them, add decorative beads or rocks to the bottom of the vase. Slice some of the fruit into round disks. Place the discs around the side of the vase. 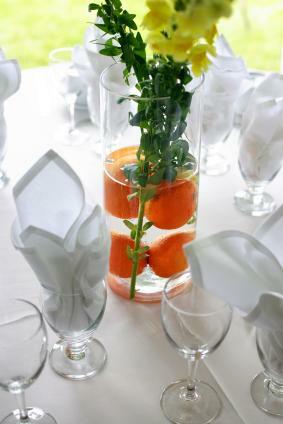 Add a few whole pieces of fruit in the middle of the vase to anchor the slices against the sides. Carefully add a few fresh cut flowers by threading the stems through spaces between the fruit. When you're happy with the arrangement, add water. Get creative by adding a slight tint of color or glitter to the water (optional). 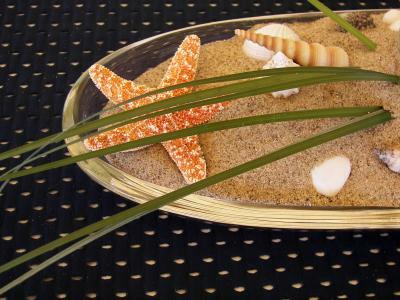 Another easy summer centerpiece is a beach-themed display. You can experiment with different shapes and sizes of glass or wood containers to see what appeals to you the most. Take a tall glass vase and begin filling it with sand. Add shells randomly as you fill, making sure the shells are visible at the sides of the vase. On the top, add a few larger shells and a votive candle. Start with a shallow container. Fill it with sand, adding random shells as you go. Place the shells on the top and sides so they will be visible. Embellish with extra items, such as tiny pieces of driftwood or long blades of grass. Arrange a cocktail umbrella to look like a beach umbrella. Place sand and shells along the bottom of a shallow glass container. Add floating, shell-shaped candles to the top. If you enjoy cocktail parties with friends, you can make flashy centerpieces using large glass or plastic cocktail glasses such as margarita glasses, martini glasses or wine glasses. Fill the glass with water and add a few drops of food coloring to make exotic-looking drinks. Add submersible LED lights and a chunk of fruit with a cocktail umbrella. Add festive ribbons, confetti and glitter around the base of each glass. Fill the glass with water and add food coloring if desired. 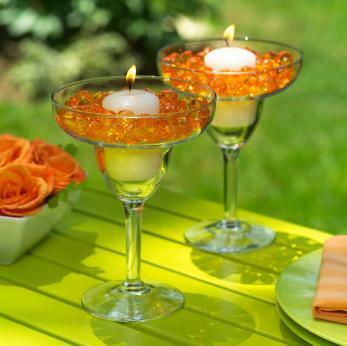 Add a floating candle to each glass.your cocktail centerpieces with floating candles. Place a votive candle in a cocktail glass and fill in with small colored glass beads. If the candles will not be lit, add fresh flower blossoms to the glass. Centerpieces do not have to be complicated to be beautiful. Try a simple yet attractive floral display. Color-coordinate the candles and flowers. Daisies, pansies and roses work well for a display like this. 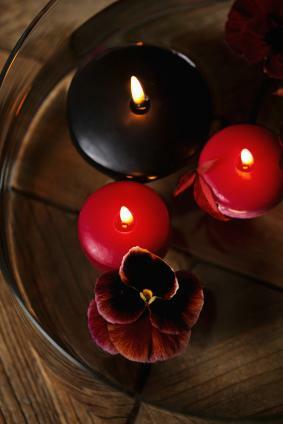 For added interest, use different sizes of floating candles or use flower shapes. Fill a glass bowl with water and add floating candles. Add flower blossoms, taking care that they will not catch fire. If desired, add a few drops of food coloring to the water. Colored glass beads on the bottom of the bowl will also make a nice effect. A tropical centerpiece is ideal for summer, especially if you're having a pool party. Use a drill or coconut straw hole drill to make a hole in the whole coconut. The hole should be big enough to add some straws and fruit slices. Place the sliced fruit on a skewer and stick the skewer in the hole in the coconut. Add the colorful straws and cocktail umbrellas to the coconut, arranging them until you're happy with the look. Sprinkle a bed of coconut flakes on a large plate or platter. Arrange the pineapple, the drilled coconut, the mango, bananas and candles in a pleasing display. Make a border around the display with raffia and a Hawaiian lei. Fresh flowers would be lovely; however artificial flowers might be more practical. If the lei doesn't fit around everything, cut it and make a semi-arch around the edge or use two to go all the way around. You can make this centerpiece as simple or elaborate as you want. Use a bamboo placemat to anchor this display. 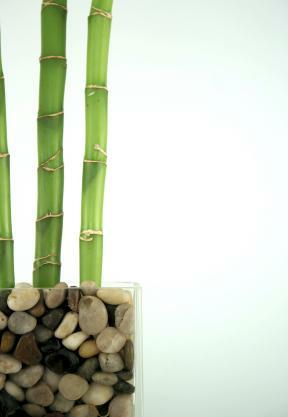 Place a few stones in the bottom of the tall glass vase and add water and two or three pieces of bamboo. You can stop here or keep going. Optional embellishments: Include items like small oriental fans, chop sticks, oriental candle holders or pagoda-style candle lanterns. If you have any small Asian collectibles around your home, such as Oriental style dragons or small Buddha sculptures, you can include those as well. These six centerpiece ideas are simple to make and each one has endless variations. Before you go shopping, look around your house and see what you already have that you can build a centerpiece idea from. You may find you already have enough materials to work with or you might come up with something completely different, which is all part of the fun of creating unique table centerpieces!